Archaeological Institute of America lecturers and hosts William and Suzanne Murray teach on the faculty of the University of South Florida in Tampa, where Bill is the Stathis Professor of Greek History and Suzanne is an Instructor in Ancient History and Classical Archaeology. Bill also serves as the Leo A. Shifrin Distinguished Chair in Naval and Military History for 2014-15 at the United States Naval Academy in Annapolis, MD. Bill specializes in Greek and Roman naval history, ancient seafaring, and nautical archaeology, and recently published The Age of Titans: The Rise and Fall of the Great Hellenistic Navies (Oxford University Press). Suzanne is an art historian whose teaching focuses on ancient civilizations and Greek art and archaeology, with a specialization in the Aegean Bronze Age. Bill has participated in underwater excavations in Sicily, Israel, and Turkey, and has conducted a number of archaeological projects in Greece, focusing in particular on the region of Actium and Nikopolis. Bill has been a national lecturer for the AIA since 1989, and served as the AIA’s Norton Lecturer in 2007-08. 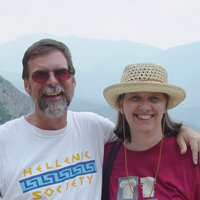 Together, Suzanne and Bill have led student study trips in Greece and lectured on tours in Greece, Italy, Turkey and the Dalmatian Coast, including four previous AIA-sponsored voyages.